Disclaimer: The photos/videos were taken by the review’s author. I’ve wanted to write a review about this essence for a really long time now but I kept postponing it, god knows why. It’s such a wonderful essence that I can’t stop blaming myself for not writing anything about it for so long. But instead of saying anything more now, let’s jump straight to the review. The packaging is mostly in Korean (apart from the front of it and the list of ingredients) so I can’t really tell what the producer’s claims as such are. The only thing the packing says is ”Wrinkle Repairing & Whitening for the first step of skin care” so my wild guess would be it’s supposed to help with wrinkles and brighten the skin. What does the website I bought it from say? Well, I’d love to tell you but they sell it on and off and now apparently they stopped selling it. I’m sure it’ll return to the online store but at the moment, as I’m writing this review, I can’t access the product’s description from their site. Accessing descriptions from other sites isn’t that easy either as they either don’t have them (online stores) or they are in Korean (eBay). So let’s just embark on the short but fortunately in English product description from the packaging. The essence helps with wrinkles and brighten the skin. It’s a kind of a ”frosty” glass so it’s partly transparent and you can see how much of the essence I have left. I bought it in mid-November 2018 and I still have so much left despite using quite a lot of it in my PM skincare routine every day. So it’s really efficient. The packaging itself is also very good as it’s glass and glass is less reactive than plastic meaning it’s a better storage material for chemicals than plastic. And of course, we all want our ingredients to work to the best of their capabilities and the glass bottle ensures the chemicals in the essence don’t react with anything as long as it’s properly stored (no direct sunlight and the lid is airtight). The downside of that packaging, though, is that it’s heavy. And heavy things cost more to ship, especially from Asia. But everything has its own price, right? Now comes my favourite bit. The ingredients list is just wonderful. And it does wonders. Here’s the ingredients list taken from CosDna that corresponds to the ingredients list on the packaging which you can see in the video above. Although the list is not long, almost all the ingredients are super safe and beneficial for the skin. Take for example Galactomyces Ferment Filtrate which is the first on the list meaning it’s the ingredient that is the most prevalent in the essence. So although I’m not proficient in Korean, I suppose the 95.7% refers to the amount of this ingredient in the essence. Moreover, surprisingly, water isn’t the next ingredient on the list. It’s Niacinamide which helps with evening the skin tone, lessening the appearance of wrinkles and skin dullness among others. Adenosine helps with skin smoothing and Sodium Hyaluronate with skin moisturization. And there are also a few plant-derived extracts that are skin friendly. The only ingredient that doesn’t excite me is Phenoxyethanol that has the yellow safety rating but it’s relatively low on the list and the benefits of the essence far exceed my worries about Phenoxyathanol’s potentially harmful effects. However, what it worth mentioning is that the FROM NATURE essence is paraben-, sulfate-, alcohol- and silicone-free. When it comes to texture, the essence is really watery. It looks like water and behaves like water. 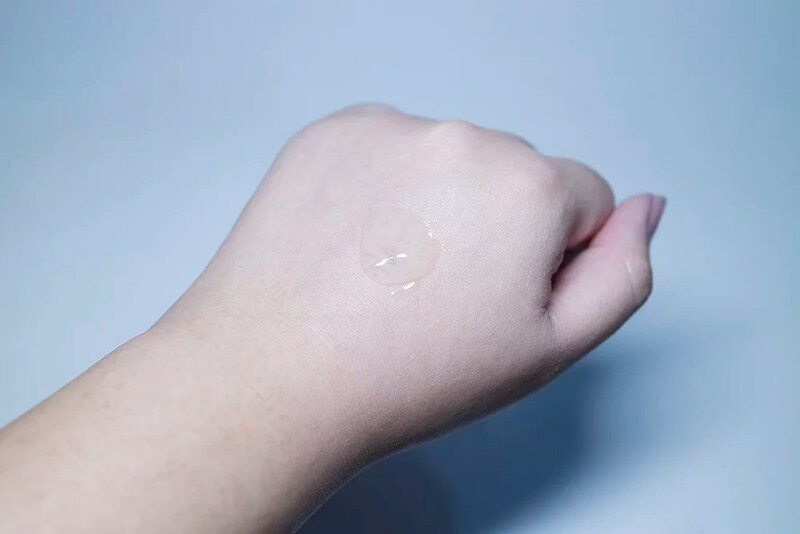 The downside of it being watery is that sometimes I spill the precious essence on the floor because I can’t contain is on my palm. The bright side is that it absorbs really fast without leaving the skin very tight or too sticky. It makes my skin feel moisturized but still ready to take on more stuff such as a moisturizing cream. So what are my thoughts? I LOVE THIS ESSENCE! One of the best skincare products I’ve tried in my entire life. It absorbs really fast but doesn’t make my skin sticky or so tight that I’m afraid if I smile it’ll leave permanent wrinkles around my mouth and nose. It’s a good mid-skincare product as it moisturizes but still leaves room for more products to be used. And the ingredients list….simply amazing. It’s got all the wonders-doing ingredients that help to fight wrinkles (or prevent them), even the skin and make it generally look better. And they actually work. After using the essence for about two weeks I noticed that my skin became much much softer and plumper. The skin tone is super even and if I have a really bad pimple that leaves the scar, the scar’s colour fades away really quickly. I have very few wrinkles and they aren’t that noticeable so I didn’t see much of improvement there but I noticed my skin became more elastic and although I’m going through a lot of stress (I’m telling you, because of that I’m aging 5 times faster than other people) I haven’t noticed any bad changes in it since I started using this product. People even started telling me I look much younger than I actually am. T^T I know this product works for me and I’m not surprised why- it’s all due to the ingredients that it contains. To put it simply- the FROM NATURE Age Intense Treatment Essence is…precious. And worth purchasing! I already bought another bottle. Although because the first one has lasted me for 4 months already and I still have a lot of it left, I suppose I won’t have to buy another essence for at least a year from now. Have you tried this product? If so, let me know in the comments if it worked for you! AUTHOR: Stella from Oh My Stellar! THIS REVIEW ORIGINALLY APPEARED ON HER BLOG HERE IN MARCH 2018. This product was provided to me by Purito for my honest review. Affiliate links are not used in this post. I was recently approached by a Korean skincare brand called Purito to test out some of their products and, with the experience that I had with them, I was more than happy to. They showed me their English website which talked about their natural and ‘honest’ approach to skincare, focusing on safe and pure ingredients. I’ll go into that a little further down but basically they asked me to choose a few products and to test them out for at least 2 weeks (and I liked that they seem genuine in wanting to demonstrate the effectiveness of their products). 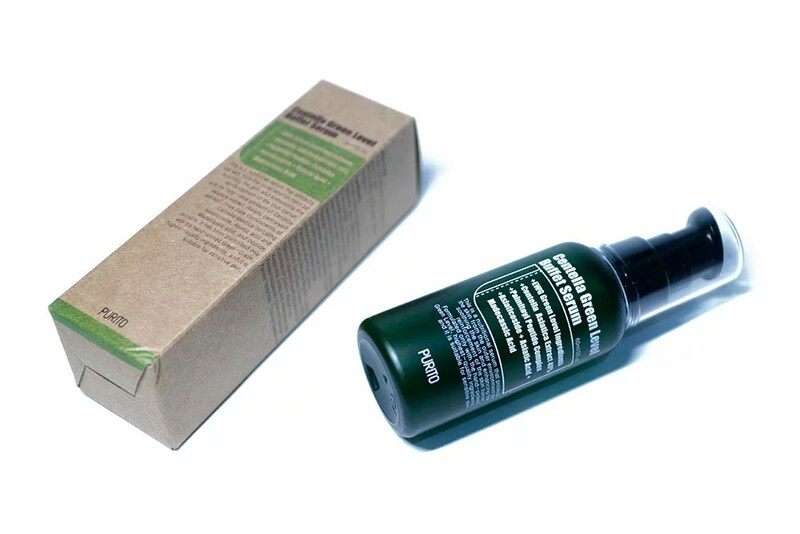 I’ll be starting off with their Centella Green Level Buffet Serum – which is one of their hero products. This is sort of an ‘all in one’ product, meaning that it has a buffet of essential ingredients to help target multiple skin needs at once. This seems really great as a daily serum and you can definitely boost it with a second serum depending on the seasons. I think that Purito products would be well suited for people with sensitive skin or those who just prefer to use natural products in their routine. So, if that’s you (or if you’ll read what I write regardless), let’s get on with the review! As I mentioned earlier, Purito is a brand that aims to focus on high quality, safe and natural ingredients. They use EWG green level ingredients (EWG stands for The Environmental Working Group and you can read about them here, as well as their rating system) meaning that their products are also safe for varying skin types. Based on the data of EWG skin deep, we will continuously give a challenge although it may be difficult to produce it. We will never put bad ingredients such as 20 types of ingredients that require caution and 26 types of allergic ingredients. Our focus will continue to be on ingredients rather than glamorous containers. We will keep the environment in mind, removing unnecessary packaging and eco-friendly material. We will never conduct tests on animals. We will only make mild, non-allergic products to strengthen natural resillience of skin. Until the day comes when everyone uses Purito, we will keep our price at more reasonable levels to get closer to you. Basically, the brand swears by using only skin safe products, focusing on ingredients rather than elaborate packaging, being environmentally friendly, not testing on animals and also being affordable to the average consumer. Although the brand states that they don’t put their focus on glamorous packaging, I personally think that it’s important to also keep it in mind – after all, great packaging always makes me more interested in continuing to use a product, and good quality is also a necessity. That being said, even though Purito’s approach is very simple and basic, the quality and aesthetic is still there – they just don’t have any brand gimmick. 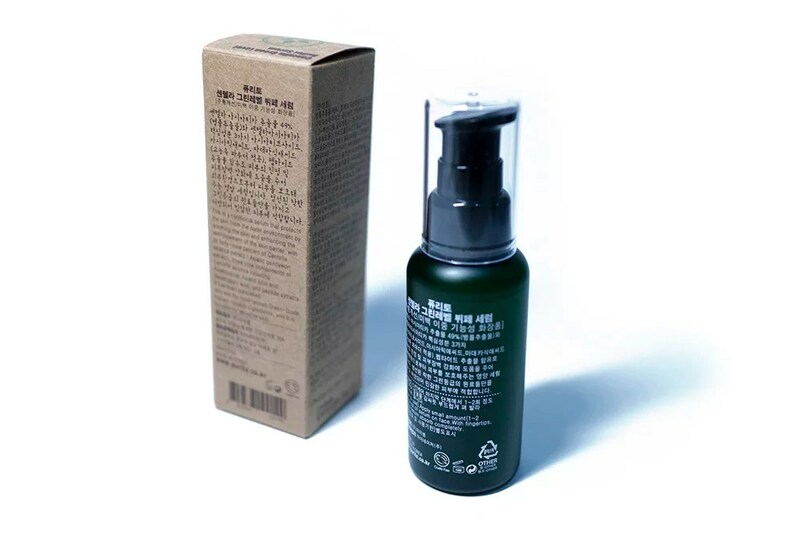 The serum comes in a brown cardboard box – the actual design of it really suits the brand image, and this type of paper is also better for the environment (it’s uncoated, so there is no unneeded plastic in it). 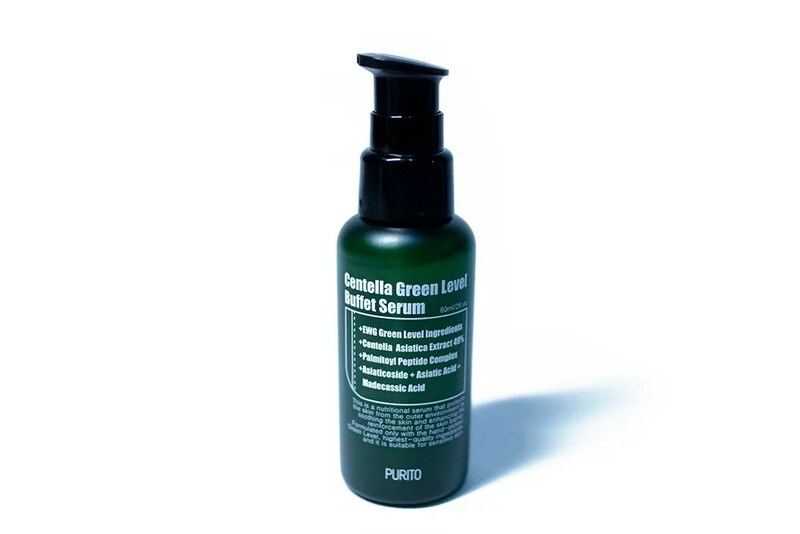 The bottle of this Centella Green Level Buffet Serum is made of a light but sturdy plastic, with a dark green colour. The pump is black and it’s smooth so it’s easy to control how much you want to dispense. This product is recommended for people who want to target multiple skin problems and people with sensitive skin, especially those who are concerned with blemishes and pigmentation. The serum has a light texture and is meant to absorb quickly. However, since there is no alcohol in the formula, it does not evaporate and retains moisture. According to your skin needs, they also have a recommended skincare routine on the product page. For myself, I worked this product into my normal skincare routine (so that I could observe the changes with only this additional product) but took out my whitening serum as I didn’t want it to overlap. So following the recommendation from Purito, I used this serum for a total of two weeks and a kept a close eye on my observations during that time. My immediate thought is that the serum has a very light, almost liquidified gel sort of formula. It feels a bit slippery and spreads/pats easily on the skin without any need for rubbing to help it absorb. There is a fresh scent but it’s very light and not noticeable enough to bother anyone. I typically use 2-3 pumps at night, and then 1-2 pumps in the morning (when I have to put make up on over it). Once applied, it leaves no sticky residue or heaviness. Other products are easy to then layer on top of it and I find that it also wears well under make up. Since the formula is a little bit cooling when you apply it, it’s also a good addition to my morning routine. After using it for two weeks, I noticed that my skin was feeling very well hydrated and smoother than usual. I also had a minor break out on my chin when I first started to use this, and it cleared up completely within the week (and it was one of those awkward ones that I had issues with for a while). This is still some scarring, but I’m hoping that longer term use will fade that more. That being said, I’m unable to comment on the anti-wrinkle properties of this product and I didn’t see much brightening, so I will likely add in the Vitamin C serum after this weekend to boost that property more. I don’t feel that this serum is a sort of miracle product that will perform miraculous feats that you see advertised pretty often, but instead it is a gentle formula that is effective over time. This is definitely very suitable for sensitive or problem skin and I think that this sort of slow, nourishing approach will be very beneficial for my skincare in the long term. Overall, I really like Purito’s brand philosophy and I’m happy that they gave me the chance to try out their range! I’m going to continue to use this Buffet Serum in my skincare routine, as well as adding in their Pure Vitamin C Serum to see if it will help fade this acne scarring on my chin as well as some of my sun spots. I am currently also using their exfoliation pads, which I will also continue to do, and I intend on writing a thorough review for that at the end of my testing period. So, until then, here’s my verdict! A light, buffet serum that targets multiple skin concerns (Skin barrier, whitening, anti-wrinkle and hydration). This is a product that would definitely benefit someone is a sensitive skin type. Personally, my skin isn’t very sensitive so I’m used to using stronger and more potent products and ingredients (some of which probably aren’t suitable for all skintypes). For that reason, Purito is a brand that I would recommend people to check out themselves and to see if it suits their needs. 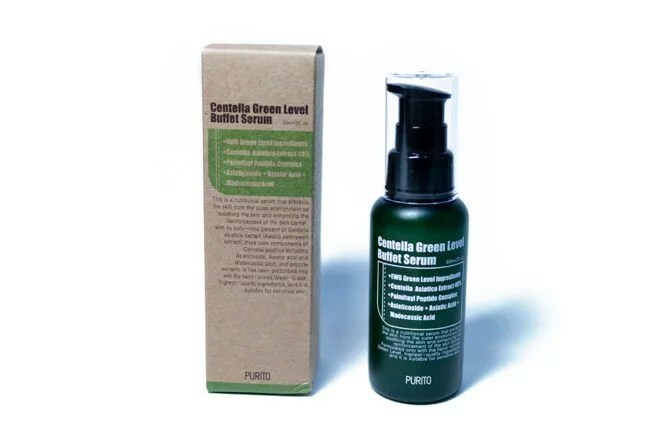 If you want to get your hands on the Centella Green Level Buffet Serum it is selling on for USD$17.30 for a 60mL bottle. Alternatively, you can also visit the Purito website to see all of the other products that they sell. THIS REVIEW ORIGINALLY APPEARED ON HER BLOG HERE IN October 2018. This review originally appeared on her blog here. You can also follow her on Instagram here. In today’s review, I will be talking about a veritable cult favourite: Mizon’s snail cream, or, as it is also known, Multi Function Formula Snail Repair Cream. As far as I can see, this is available online only. I have trawled quite a few blogs in both Korean and English, and even their company site, as far as I can remember, only delivers online. This, of course, can be tricky for those of us who would much prefer testing a product in person before buying. EDIT: The company contacted me to advise that their products are also available through a store called Village 11 Factory, Sinsa, Garosugil. I have not personally been to this store, so if you have been, please share your experiences in the comments. This retails for KRW39,900 last time I checked locally, though Mizon frequently puts these babies on sale. I remember purchasing them for about a manner (KRW10,000, roughly USD 9) in the past. This cream is housed in a dark brown glass jar and comes with a protective plastic lid. To be honest, the packaging could be improved on. A pump would be much better suited to this product in my opinion, as the cream is quite runny and would lend itself to pumping or using a different kind of dispenser. The cream is a translucent white gel cream. Due to its slightly gelly, viscous, slimy texture, this goes on very smoothly and spreads easily. Of pretty much nothing. Perhaps a slightly playdoh-y scent that does not linger and is non-intrusive. This is not meant to replace your regular moisturiser, it is meant to go UNDER your moisturiser according to Mizon. A lot of people seem to be confused by this concept. This is not meant to replace the last step of your current skincare routine – it goes on after toning. You then follow up with serums, moisturisers, oils, sleeping masks and the like. This is how I used the snail cream, too: I would tone first and then follow up with moisturising serums, essences, moisturisers, oils (evening routine) or sunscreens (morning routine). When I was still using the cream, this was helpful in managing my acne and reducing overall inflammation. I did not find it to be very moisturising and thought of it as a treatment product for acne breakouts. It did indeed work very well when used in this manner, as my breakouts were reduced while I was using it. When I first started using it, I saw the best results from a single product that I had seen in a long time; breakouts were reduced and future acne sort of went back in itself. I would consider repurchasing this in the future. I just wish it were accessible instore somewhere, as I actually do not like online shopping. I also wish that it were a bit more hydrating. This was fine when I was in my mid-20s, however now that I am fast approaching 30 and my skin is getting a bit drier, this is slightly drying at this point in time. For now, I am using up different products and am focusing more on hydrating ingredients and moisturising skin care.